Exhaust Gas Technologies Inc. and Kenny Bernstein Racing Inc. have teamed up for the 2007 NHRA racing season! (Jan. 22, 2007) I am sure you are all anxiously awaiting an update on our first “test and tune” session in Las Vegas. 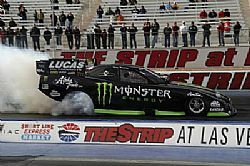 We arrived at “The Strip” at Las Vegas Motor Speedway Friday afternoon, Jan. 19 and began setting-up which continued through Saturday. We made a couple of attempts on Sunday but only going part way down the track. We are in the beginning process with a new operation, and have to work our way down the track in baby steps before we can turn it loose with a wide open throttle. It’s been very cool in Vegas and the track is a bit green. We have a long way to go and will remain in Las Vegas until Tuesday. At that time, we will head over to Phoenix for another 7-8 days of “test & tune”. "EGT" has been testing our new "HYPER BULLET" EGT sensors, which we have been very please with the testing feedback! Please stay tuned for details of this new product release.